If you google “issues facing real estate in 2019,” over 80% of the top articles name affordability of housing as an area of concern. And that should be no surprise. With greatly increasing home prices, mostly flat wages, and rising interest rates (in what HAD been a historically low interest rate environment), housing across the country has become much less affordable over just the last two years. But what does that really look like, how big of a concern is it, and what impacts does it have on a market? Housing affordability is affected by three main factors – home prices, interest rates, and area median incomes (AMI). The higher the home price and interest rate, and the lower the AMI, the less affordable housing is going to be. That number is normally expressed as a percentage called “housing cost burden” – the percentage of income that a household has to pay towards housing costs. Look at the chart below, which shows the regularly accepted ranges of housing cost burden. Typically, when somewhere around 30% of AMI is going towards housing, it can impact a household’s financial decision making. The household will tend to either look for cheaper housing or make cuts to other areas of the budget. Functionally, demand for housing decreases when cost burden goes up above 30%. And the higher cost burden goes, the more it will decrease housing demand. Look at the chart below. This shows the 2016 housing cost burden of 11 cities across the country. The top 5 cities (including Jacksonville) were mentioned in a recent Marketwatch article that will be discussed later in this article. The next 3 cities are typically mentioned as some of the “hottest” cities in the country. And the last 3 cities are the other largest cities in Florida (besides Jacksonville). What the chart shows is that only 3 of those 11 cities – Denver, San Diego, and Miami – were cost-burdened in 2016. ***To come up with the mortgage payment, we used the Nov 2016 interest rate of 3.47%, and added 20% on top of the mortgage payment for property taxes and insurance). Now look at the next chart. This chart shows the 2018 housing cost burden of the same 11 cities. Home prices have drastically increased (22% on average), interest rates have drastically increased (from 3.47% to 4.81%) but median incomes have stayed the same (last data available was from 2016, so it was used for both ranges). Now, 6 of the 11 cities are cost burdened with another city very close at 29%. The most interesting piece of data that was found in these charts was the appreciation percentage from 2016 to 2018. For the three cities that were already cost-burdened, 2016-2018 appreciation was 14%. For the 8 cities that weren’t, appreciation was 22% – a 57% difference! Markets that are not already cost burdened should have a much longer “runway” than markets that are cost burdened. Because affordability is expected to continue to decrease – the vast majority of experts predict appreciation and interest rate increases will outpace wage gains – affordability is a concern for all markets, but much more of a concern in a market that is already cost burdened. In those markets, you would expect to see decreased demand, simply because there are less people who can afford the homes in those markets. This effect will trickle down to neighborhoods within a market as well. There are many different price points within each market. Decreasing affordability will tend to decrease demand for the less affordable (more expensive) neighborhoods within each market and increase demand for the more affordable (less expensive) neighborhoods within each market. 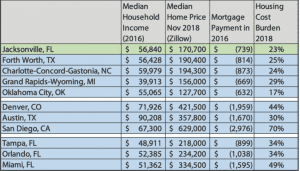 We have already been seeing that in Jacksonville, with home price appreciation in the B and C neighborhoods outpacing home price appreciation in the A neighborhoods, and we expect it to continue. Last week Marketwatch published an article titled “Good Jobs and Affordable Homes – Millennials Should Look to These Cities”. The five cities named in the article were the top five cities from the cost burden charts previously mentioned. The article is just one of many that have been written above affordability recently and it highlights how affordability itself is becoming a draw and attracting both people and jobs. Of course, the more people you attract to a market, the more demand for housing goes up, and the less affordable housing will become. However, because of declining affordability overall, the affordability of a market should be considered a large factor in that markets long-term demand potential. Home affordability is a far-reaching topic, and one that can seem nebulous until you break down its components and put some numbers to them. 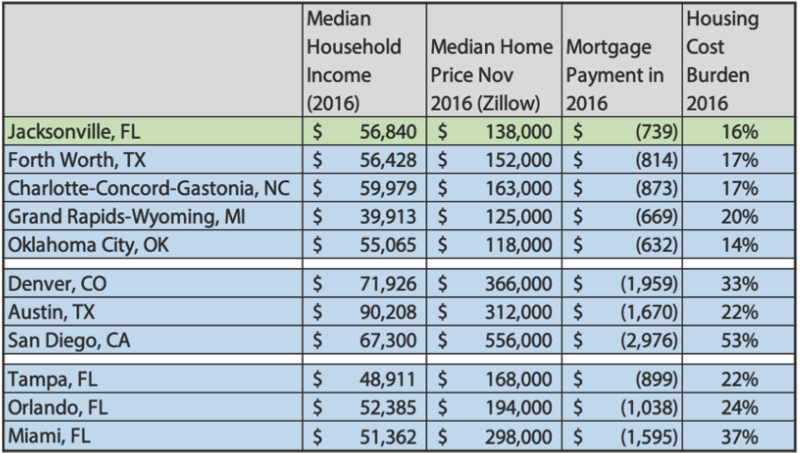 From the data it is easy to see that while housing affordability is a large concern, and should continue to become an even larger concern in the future, the “silver lining” is that markets – like Jacksonville – that do have affordable housing should see positive economic development as a result of that affordability.